It’s good to see more companies getting into the solar thermal game. I do have some doubts about eSolar’s business model though. First it seems it seems that they are relying on their software to give them a major advantage. While it may be in the beginning I doubt it would be a long term advantage as others would surly copy it, if it were that much of an advantage. The idea of using cheap mirrors seems to have an advantage but all mirrors are not created equal. 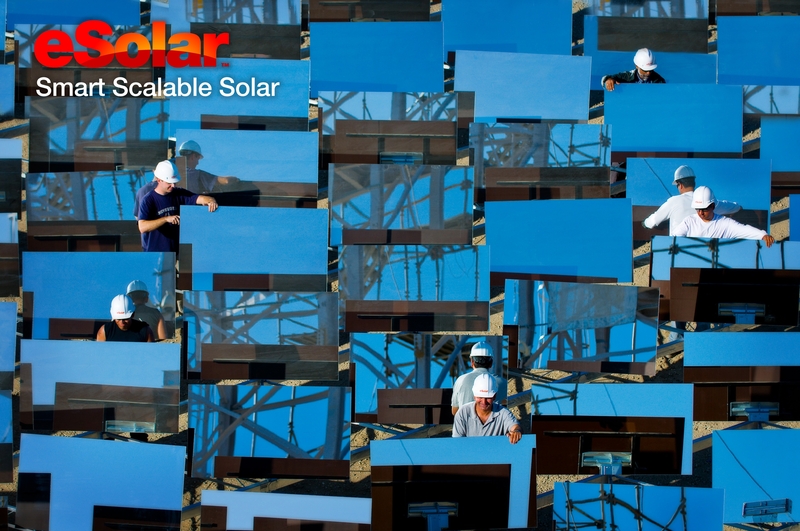 The current solar thermal plants use high reflectivity mirrors to maximize efficiency. Ausra is planning on using a more conventional type of mirror so we will have to see how it goes. Ok I like the modular design but question the logic of building only 33 MW plants. Yes they are quicker to get permitted but would have much higher operating costs. The current theory, held by many in the industry, is that we need much bigger plants, than we have now, to help bring operating costs down. One last problem I have is putting them next to where the energy will be used. While this may be great in Las Vegas or Phoenix I have some serious doubts it will work well in non desert areas. There is just simply much less solar radiation and solar-thermal plants need continuous sun to operate properly. Ausra does plan on building a plant in the Central Valley of California and I would love to be proven wrong. I have no doubt it will operate but think they may be giving up too much efficiency to operate profitably. I do wish eSolar luck. The more different designs we try the more information we will get. Wonder how google wants to tap this opportunity. I think alternate energy is the next big cash cow. Remember, ex-CEO of SAP Mr. Shai Agassi is after his ambitious electric car or green project venture. Google must be having similar plans. The momentum is building. Thank God! This can only help shove Washington, and the rest of the country in the right direction. I am thinking that Google is not only a good internet investment, but a catalyst for positive change in our country’s future. Maybe it’s time to buy? .com for the best solar energy equipment links. Also http://www.altenergystation.com for great information on how alternative energy and power systems work. Agreed that operating costs will typically be more for smaller plants but the idea of putting the plants closer to the homes is that it will save money in line losses. Hopefully the line loss savings will offset the operating cost difference. God bless them, I hope it works. Another reason for locating close to the customer is to offset peak loads – the greatest power consumption occurs in the heat of the afternoon in the summertime. The power provided by the solar power systems relieves some of the overcapacity needs of the conventional power-generating system (coal, gas-fired, etc.). However, at least here in Central and South Texas, the summertime heat of the day lingers well into the evening. I remember 1998 having temperatures in the 90s at 10:00 pm in July. And with the sun down, while more heat is not being pumped into the enviroment by our sun, the solar power system is also not providing any power for the air conditioners cooling homes and business buildings. I could tolerate the nighttime “heat” when I was under 30 years of age, but now that I am over 50, it is really difficult to have any personal energy.